Sure, you try to work out as often as you can, but sometimes it’s really tough to find the hour or so you need to get in a solid sweat session. But apparently your fitness doesn’t have to suffer if you’re short on time. According to new research, all you need is seven minutes. That’s the major takeaway from a new study published in The Journal of Sports Medicine and Physical Fitness. 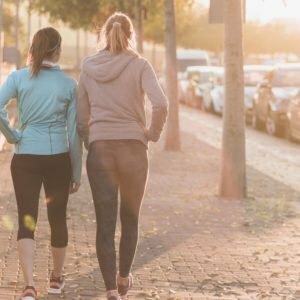 For the study, researchers had 29 people between the ages of 18 and 30 do a seven-minute workout that combined aerobic and resistance exercises every day for six weeks. After the six weeks, the researchers found that people who did the workout had a lower BMI, decreased waist and hip circumference, and lower fat mass than before they started. “Even in normal-weight individuals who perform the seven-minute workout, improvement through a decrease in waist circumference can be achieved thus leading to a better cardio-protective nutritional status,” the paper concludes. WHAT?! The workout actually isn’t anything you haven’t done before. According to lead study author Dr. Lama Mattar, an assistant professor of nutrition at Lebanese American University, it’s a high-intensity short duration workout of 12 exercises performed over 30 seconds, with a 10-second rest period between. Those exercises include jumping jacks, wall sits, push ups, crunches, step ups into chair, squats, triceps dips, planks, high knees running in place, lunges, pushups, and side planks. That’s seriously it. “It can be done in a small space and requires just a chair as material,” says Mattar. The workout is so effective because it’s just like any other high-intensity interval training, which pushes a person’s body to maximum capacity, he says. “It is very short and can be done at home or in the office which gives flexibility to busy individuals that have time constrains,” Mattar adds. Unfortunately, you can’t work out for seven minutes a day for the rest of your life and expect to be super-fit. “The seven-minute workout will not replace a full and complete workout program but it is a good entry point to improved fitness and body weight control,” Mattar says. Still, when you’re pressed for time, it’s not a bad option at all.